Now that the mass media hype is basically over with the crazed Muni gate controversy over the optical sensors giving free entry into Muni metro, it's time to focus on making improvements on the brand new equipment. 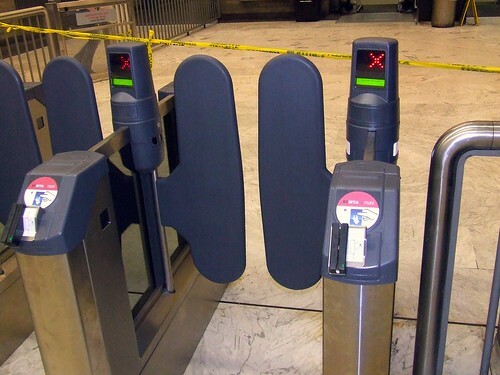 There needs to be more of the self-service ticketing machines at the Powell station's main gates (west entrance). An easier interface or process would be helpful. I shouldn't have to press multiple buttons just to add $5 of Clipper e-cash to my card. Simplify man! They should be moved to a more prominent location. For example, the ones at Castro station should be relocated closer to the agent's booth. It may also be helpful to install one next to an agent's booth, and have a helpful sign pointing others to the other ones. How about express machines that takes credit only? 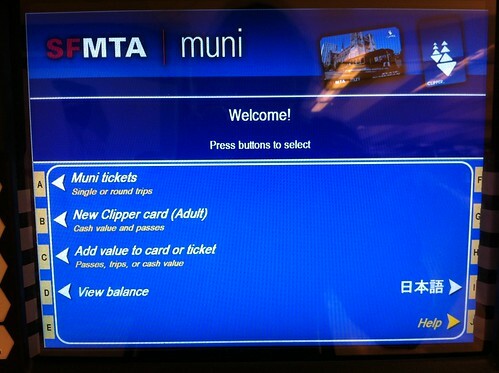 Muni could also consider buying machines that can quickly sell a pre-loaded Clipper card and avoids the need for using the complex interface on the full service machines. The perfect equipment is those telephone card vending machines that requires exact change in bills. I should mention, BART ticketing machines will eventually be able to load Clipper cards which will reduce demand on the Muni ticketing machines, but that's many months away. Put stickers on the gate doors to tell people to walk through to exit. A helpful sticker or illustration on the gate to show people where to tag card. An arrow, perhaps? A cheap stand alone sign near the gates with illustrations on how to tag card or swipe paper pass. During certain hours, dedicate certain gates for entry only, and others for exit only. Make a different sound on the gates for a "bad" Clipper tag. Example: in Japan, they use a doorbell chime. Although not really an improvement, money could be made by placing advertising on the doors. Got some ideas? Leave me a comment. I've seen users try to run their Clipper through the fast pass reader a few times I think the picture causes some confusion. This should go away shortly though. The display is too small. I didn't even notice they were there the first few times I went through. One thing I notice across all Clipper readers is that they do not display when the transfer expires. Finding the expiration time requires a second tag on a different reader. One thing they need to fix is that 10 minute before tagging again as I went in the West Portal station outbound successfully but remember I needed to buy a newspaper outside so I went outside and got the newspaper and then tried to go back in, this time it says Card has already been used and had the red X. I have the M Adult Pass loaded on my clipper card and I don't see the purpose of the 10 minute wait requirement before you can tag at the same station or same bus again since even if you did use the e-cash on the LUT or Clipper, there would be that 90 minute transfer anyways so it's not like you will get charged again unless they are worried that you might lend your card to someone else to enter but then the other(s) would get hit with the fine when the fare inspectors arrive. There's a good reason why there's a 10 minute wait time before entering the same vehicle or station. It's better known as "passback" where a person could literally pass his/her card to the person behind to score a free ride. The passback rule is in place to prevent that. Even in the NYC subway system, Metrocards with unlimited ride passes can't be used again for a certain period to prevent cheating, especially at stations where agents can't observe other entrances. You shouldn't have to push *any* buttons to add money to an existing card. * Tag a clipper card, which will add the money to the card. * Push a button to buy a temporary card. For a credit card, insert the card, ask the user to type in a dollar amount, then print or tag. As for passback--here's where I used to use it: Tag in at the muni station. Note that my balance was low. Go back, add cash, then go back in via the swinging gate. Dunno what I'll do now in that situation. Yes but what happens if you did exit and needed to get back in like I did, is there actually a way to get back in without having to wait the 10 minutes? I know the gates will not let you back in but couldn't the station agents let you in? My mother who doesn't understand, speak/read/write english had a interesting problem this morning at West Portal Station. She has a RTC Discount Translink Card and I loaded the October 2010 monthly pass using the machine there yesterday. This morning, she tagged the card at the West Portal Station and it gave her the red X and then tried a second time and it gave her the red X. So she was about to use her September 2010 Senior Paper Pass when the agent came out and let her in using the emergency gates. When I called Clipper Customer Service and checked the transaction history, it shows the 6:03AM tag and it using the Muni Disabled Pass but it never successfully let her in. We both keep our receipts of the loading the the passes with our cards as proof of the pass purchase. What if there is no station agent; how will I enter with my transfer? If you have proof of payment, enter the faregate nearest the station agent’s booth. Now this begs the question, does the faregate nearest the station agent's booth remain open without tagging when the agent isn't around or how will the person with a transfer actually enter in that scenario since I thought all the gates requires tagging or swiping the monthly pass. Answering the first question: "I know the gates will not let you back in but couldn't the station agents let you in?" Maybe, maybe not. It's their call. Regarding the RTC card issue, is it possible your mother didn't tag her card correctly? Some have been using the black cardswipe which is supposed to be for the paper passes, while the round red/white circle is the tagging zone. Lastly, it turns out when an area is unmanned/supervised, the gate closest to the booth is unlocked and should only be for folks with paper transfers. I noticed a new sign at the secondary agent's booth at West Portal stating that. She tagged correctly because I just went with her to have her demonstrate exactly what she did and it worked this time. It could just be a system malfunction for all I know since clippercard.com shows the tag in the Transaction History at 6:03AM so it could have authorized the tag but did not acknowledge it with the green or the red and the associated sounds and then when she got the two red things when she tried 2 times, that was when it's just the Card Already Used message. What's mysterious was that if clippercard.com shows the transaction payment, the gates should have opened to let her in. As far as the second answer, I guess the bad part is that there will be people who will walk in without a valid payment if the station agent's booth is closed. I think the major problem with people who use Clipper/Translink either with ecash or a monthly pass that don't speak, read, or understand english is that unlike having a paper transfer, currency or a monthly paper pass, it's harder to prove your point when it all really depends on how the computer is feeling at that moment.